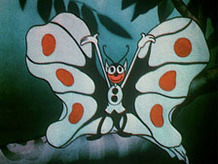 An experimental color short in Brewster Color, preserved by George Eastman House and presented on the More Treasures DVD set. San Francisco, CA (May 18, 2016)—The National Film Preservation Foundation today announced grants to save 64 films, including The Streets of Greenwood (1963), a documentary about civil rights activists registering African American voters in Mississippi, and James Blue’s The Olive Trees of Justice (1962), which won a critics’ prize at the Cannes Film Festival. Shot in Algeria during the war for independence with nonprofessional actors, The Olive Trees of Justice tells the story of a Frenchman born and raised in Algeria and his torn loyalty between the two countries that shaped his identity. All together grants were awarded to 39 institutions across 24 states. Among the other films funded for preservation are Howard Alk and Mike Gray’s documentary The Murder of Fred Hampton (1971); Les Goldman and Paul Julian’s animated short Hangman (1964); Holly Fisher’s Watermen (1968), about the “skipjack” fleets that harvested oysters in the Chesapeake Bay; footage of the young Ruby Bridges at William Frantz Elementary School, filmed by her teacher shortly after the six-year-old became the school’s first African American student; early computer animation by Ken Knowlton and Stan VanDerBeek; amateur footage from the 1930s taken at a Trappist monastery near Louisville, Kentucky; and rare 28mm prints of educational and industrial films from 1913–19, including The Mysteries of a Machine Gun (ca. 1918) and The Latest Kinks in Canning (ca. 1917). For a full list, click here. The NFPF preservation grants target newsreels, silent-era films, culturally important home movies, avant-garde films, and endangered independent productions that fall under the radar of commercial preservation programs. The awards provide support to create a film preservation master and two access copies of each work. Films saved through the NFPF programs are made available to the public for on-site research and are seen widely through screenings, exhibits, DVDs, television broadcasts, and the Internet. Since its creation by Congress in 1996, the NFPF has provided preservation support to 284 institutions and saved more than 2,287 films through grants and collaborative projects. The NFPF also publishes the award-winning Treasures from American Film Archives DVD series, which makes available rare films preserved by public and nonprofit archives that have not been commercially distributed. The NFPF receives federal money through the Library of Congress to distribute as grants but raises operating and project funding from other sources. The National Film Preservation Foundation is the nonprofit organization created by the U.S. Congress to help save America’s film heritage. The NFPF is the charitable affiliate of the National Film Preservation Board of the Library of Congress. For the complete list of projects supported by the NFPF, visit the NFPF website: www.filmpreservation.org.